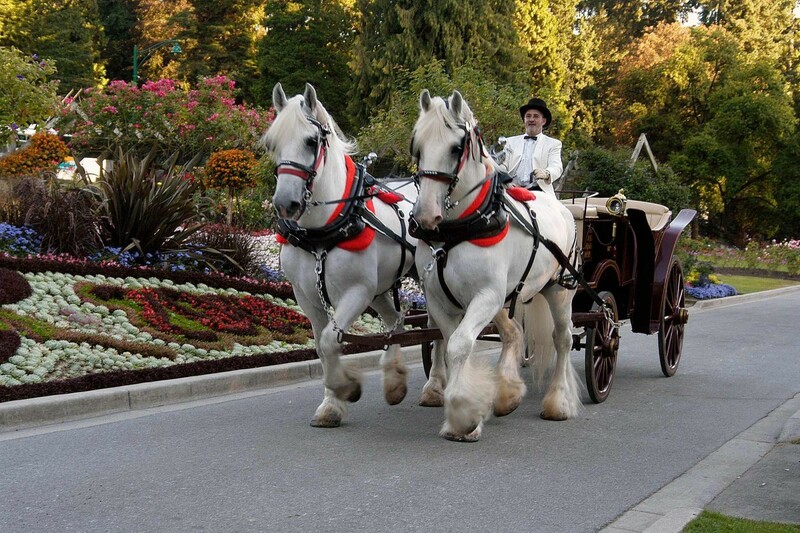 Step aboard one of our old-fashioned horse-drawn vehicles and meander in comfort through the natural beauty of Stanley Park, Vancouver’s #1 attraction. Relax to the gentle clip clop of the horses’ hooves and take in the fresh scent of cedar and the sea as a professional guide fully narrates your one-hour tour featuring Deadman’s Island, Vancouver’s harbour, the Lions Gate Bridge, a coastal Red-Cedar forest and the Rose Garden, with stops at the famous Totem Poles, Girl in a Wet Suit Statue, and S.S. Empress of Japan Figurehead. 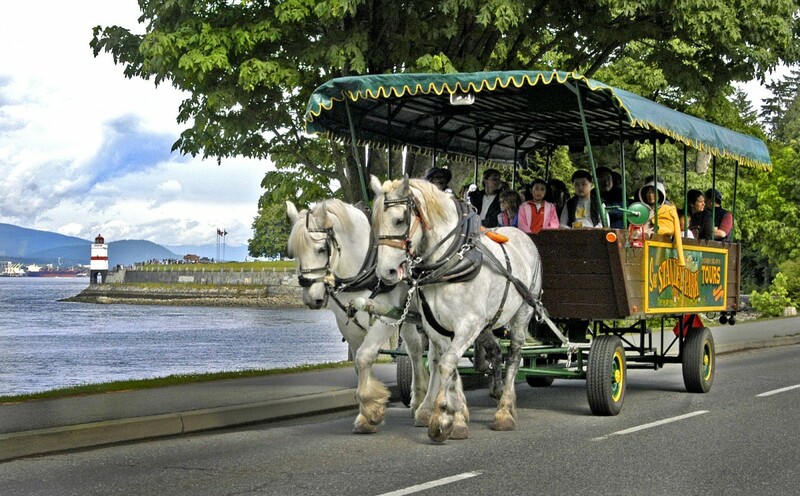 Horse-drawn tours are wheelchair accessible, covered, and depart every 20-30 minutes, daily, rain or shine. 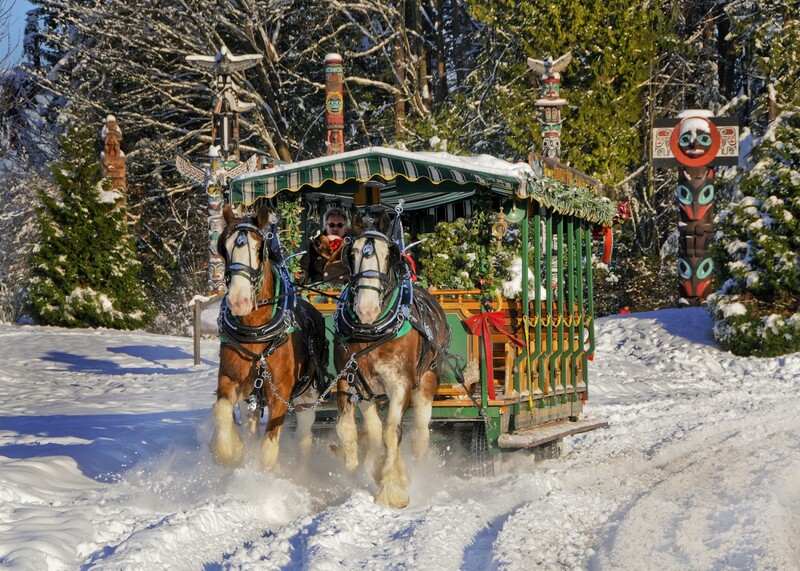 You can take a bus tour anytime, but how often do you get a chance to see the sights by horse-drawn carriage? 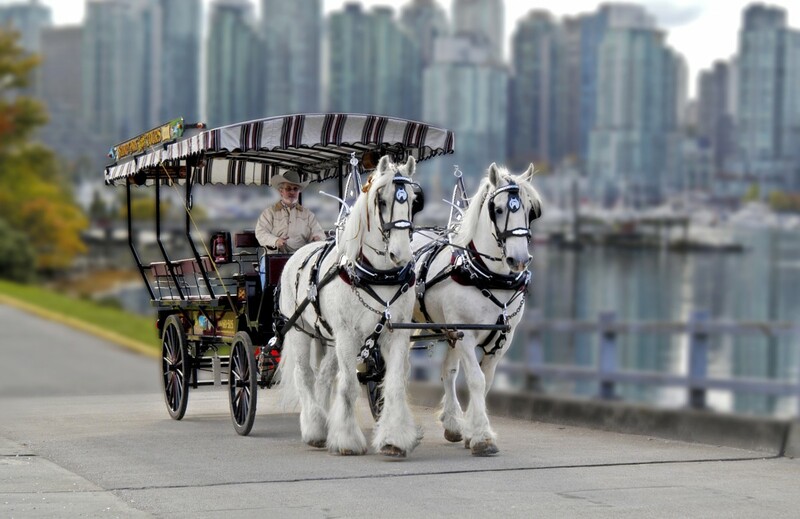 Step aboard one of our old-fashioned horse-drawn vehicles and meander in comfort through the natural beauty of Stanley Park. 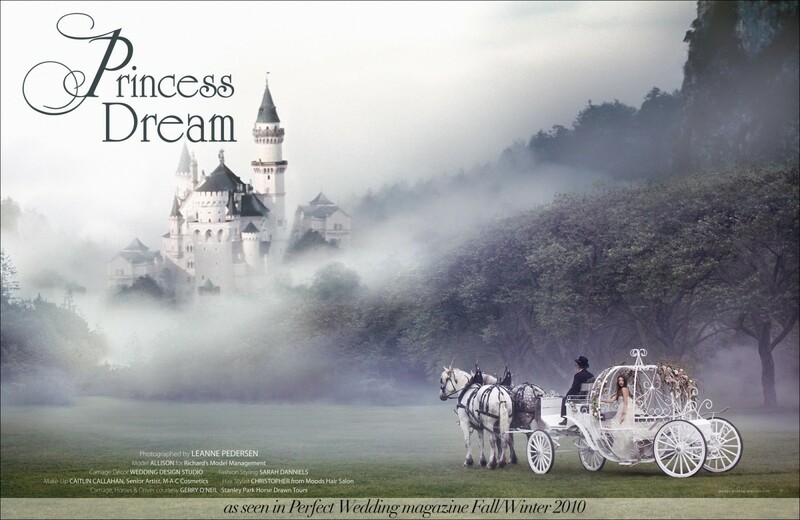 A professional guide fully narrates your exploration of this thousand-acre wonderland featuring Deadman’s Island, Vancouver’s harbor, the Lions Gate Bridge, the Rose Garden and other notable sights. 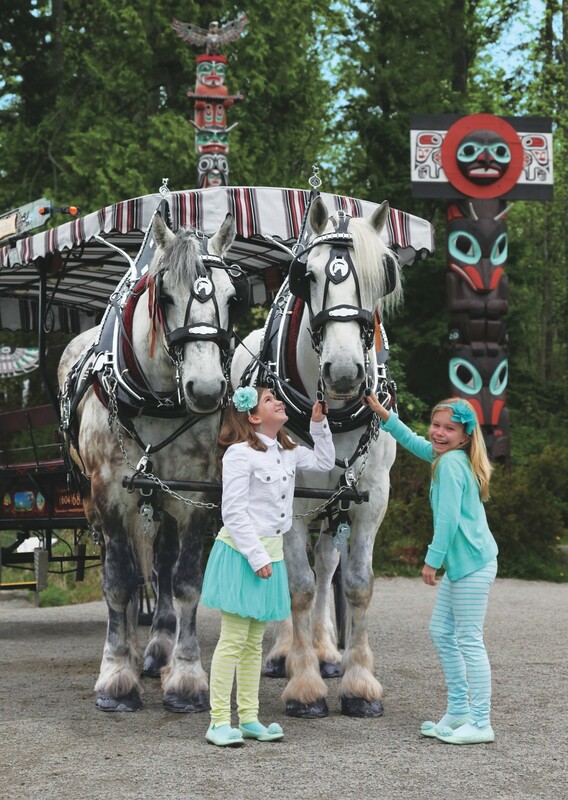 Stop to view the Park’s majestic Totem Poles, the Girl in a Wetsuit Statue and the S.S. Empress of Japan Figurehead. Relax to the gentle clip-clop of the horses’ hooves, and take in the fresh scent of cedar and the sea as you learn of the area’s special historical and natural features. 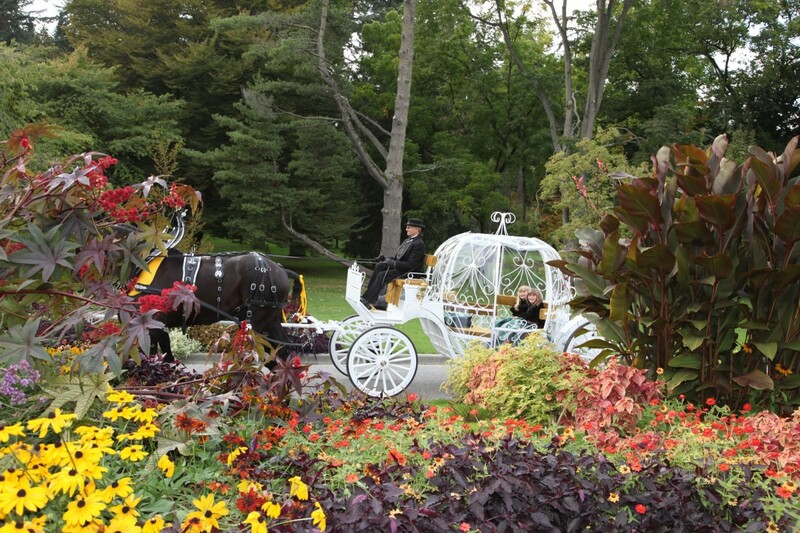 A variety of horse-drawn vehicles are available on a reservation basis for private events. 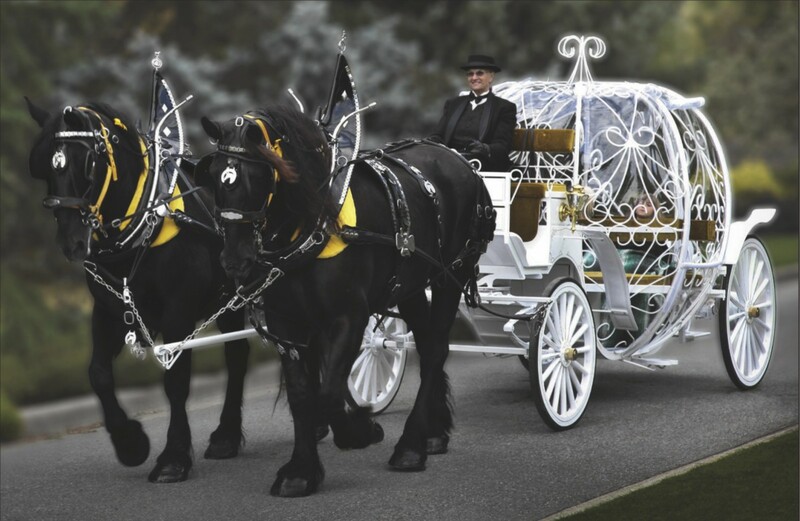 Check out our ‘Private Carriage Reservations’ page on our website. 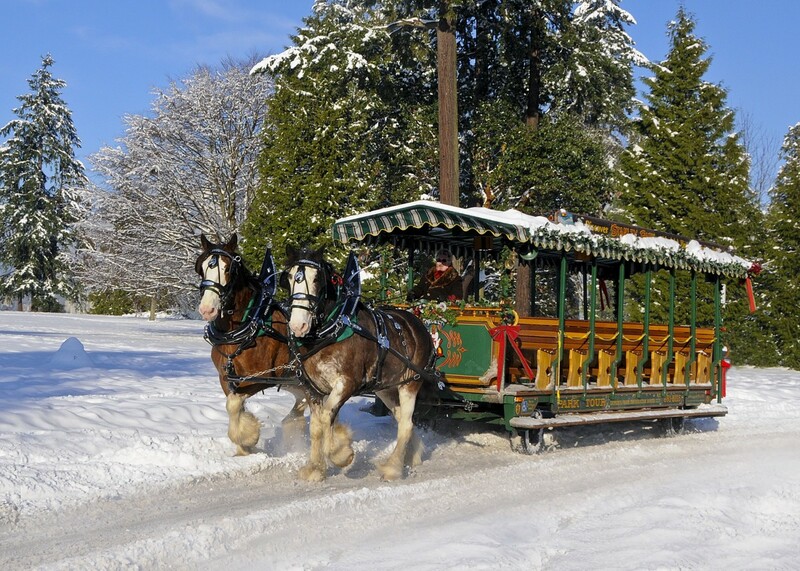 Situated in the heart of Stanley Park just a 10 minute drive from downtown, a 10 minute walk along the sea wall to Harbor Cruises , across the street from West Coast Sightseeing Hop-On Hop-Off stop P7 on the Park Route. Buy all three from this website and save 25% on your whole experience. Departs from the Stanley Park Information Booth. 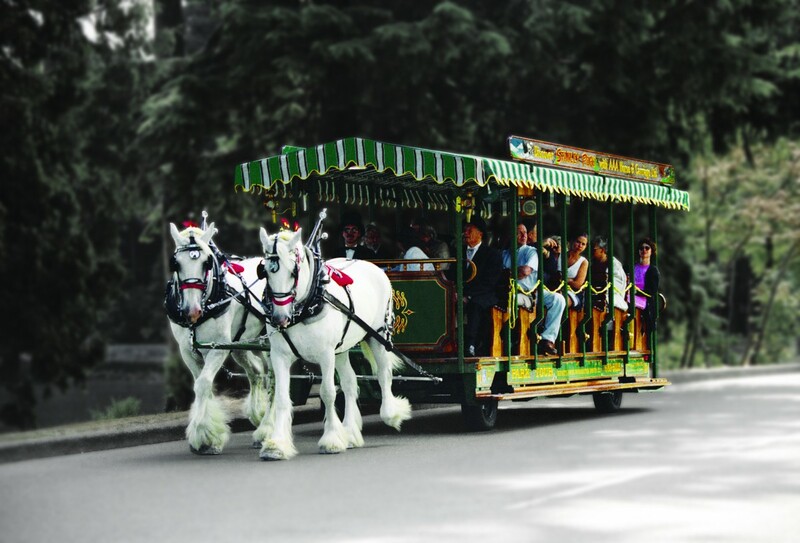 Tours start from the horse-drawn tours kiosk, beside the info booth on Park Drive, just off the Georgia Street entrance to Stanley Park. Accessible by foot, car or transit. Tours depart every 20-30 minutes, daily*, rain or shine. * First and last departure times listed.